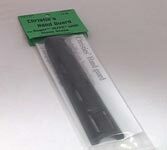 Manufacturer: Christie & Christie, Inc.
Christie's Hand Guard made for the Ruger 10/22 with wood stock. Ventilated and protects from barrel heat. Looks great and installs easily with no straps and no modifications to your gun. Comes with simple installation instructions. It is made of polymer and is heat, oil, solvent and acid reisistant.